You will win every time. You can cherry pick data and there’ll be no time to point out the flaws, you can pull out dodgy science and there will be no time to point that out. You can pull out arguments that have already been resolved. You can find one of those [arguments] that the person you’re arguing with hasn’t heard of and then it will be next Tuesday by the time you have gone off to research it…. This technique of using a machine-gun style delivery of numerous misrepresentations strung together is perfectly demonstrated in the show by Marc Morano, of the free market, climate sceptic think-tank the Committee for a Constructive Tomorrow. Morano is a former communications director for Republican Senator James Inhofe, who himself believes global warming is the “greatest hoax ever perpetrated on the American people”. Coal and oil interests obviously love him – according to Oil Change International analysis Inhofe has accepted more than US$1.3 million from the fossil fuel industry since the late 1990s. In the show Morano delivers a devastating and convincing 35-second blitzkrieg of climate science misrepresentations, in the way that Goldacre describes. In the segment, Morano’s claims go unchallenged, but we can easily check them here. First, Morano says Arctic sea-ice is “9000 Manhattans” above the low point of 2007. 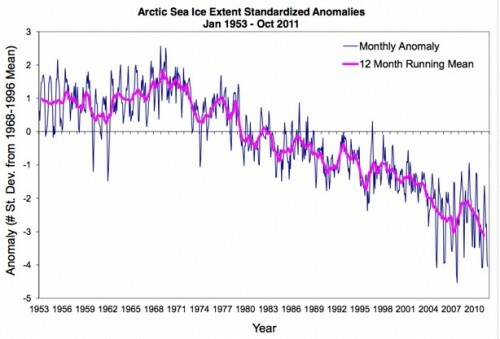 Morano is cherry picking one point in time to argue that sea-ice isn’t disappearing from the Arctic. As he must surely know, climate change is observed by looking at long-term trends rather than single events. So what’s the trend that Morano ignores? It looks like this, from the US Government’s National Snow and Ice Data Center. Morano of course also ignores the serious reduction in the thicker, multi-year ice, which is also trending downwards. Morano then moves on to sea level rise, caused by oceans expanding as they get warmer and by melting glaciers and ice sheets. He claims sea level has just seen a “historic drop” and is “falling”. He cites the European Space Agency and NASA as proof. Let’s take a look at what Morano has just dismissed. Now, the European Space Agency. Remember, we’re still tackling Morano’s 35-seconds of trickery here. Next, he claims global temperatures hit a high point in 1998, desperately clinging on to a climate denial meme that has long-since died. Morano’s previously favoured source NASA has pointed out that nine of the 10 warmest years on the modern meteorological record have occurred since 2000. In fact, the two major US Government agencies dealing with temperature records – NOAA and NASA – both put 2010 as the warmest year on record, as does the World Meteorological Organization. But Morano now ignores those. The only main temperature record which did have the warmest year as 1998 was that of the UK’s Met Office, but after updating its method to include more observations from the Arctic (which was previously under-represented) the Met Office now says 2010 is the warmest year on it’s record going back to 1850. The year 1998 is now ranked third. Morano dismisses this by claiming that temperature records that show 2005 and 2010 as being the hottest years are based on “hundredths of a degree”. If only Nick Minchin or Anna Rose had pointed out to him that he based his own claim made in his previous breath – that 1998 was the warmest year – on two-hundredths of a degree. Apparently, this is OK when it suits Morano’s own argument. And don’t look at the trend. Finally, Morano uses a recent Gallup survey of people in 111 countries to claim “that the majority of the human race are not even scared of global warming”. Morano is likely referring to this Gallup survey, which found that in 2007/08, 41 per cent of the people surveyed (1,000 people each in 111 countries) said they thought global warming was either a “very” serious threat to them and their family, or “somewhat” of a serious threat. The latest result, for 2010, puts this figure at 42 per cent. But is Morano seriously suggesting we should formulate policy based on people’s fears or beliefs, as expressed in a Gallup telephone poll? If so, he might want to start formulating a policy response to the Gallup survey finding that 73 per cent of Americans hold a belief in the paranormal. Perhaps he’d advocate tax relief for witches or cutting red tape for owners of haunted houses? Morano’s organisation, the Washington DC-based CFACT, is one of the most overt and shameless climate sceptic think-tanks on the planet and has received funding from oil companies and the foundations of oil and banking billionaire heir Richard Scaife. Morano also runs a blog for CFACT called Climate Depot, which publishes links to sceptic news items. But his blog has also been implicated in the campaign to intimidate climate scientists and writers around the world. Morano likes to publish their email addresses prominently on his blog. 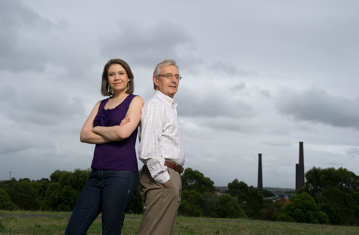 ABC presenter and Sydney Morning Herald columnist Richard Glover has been one lucky recipient of the nasties sent out via Morano’s dog whistle. Others who have had their emails published by Morano (who incidentally defends his action in the show saying they’re all publicly available) include Australian author Haydn Washington, atmospheric scientistKerry Emanuel and the late Professor Stephen Schneider. Morano has a very low opinion of climate scientists, once stating that they deserved to be “publicly flogged”. Another leading climate change scientist at the receiving end of Morano’s online bullying tactics has been Professor Michael Mann. The Penn State University scientist spoke to the ABC’s Lateline programin March about the intimidation of climate scientists – something he covers at length in his book, The Hockey Stick and the Climate Wars, in reference to his famous reconstruction of global temperatures going back one thousand years which showed a sharp spike after the world started burning copious amounts of fossil fuels. Morano is just a cog in a larger attack and disinformation machine. As I point out in my book, he is funded and abetted by the very same corporate interests who help bankroll the climate change denial effort in the U.S. His modus operandi of publishing scientists emails, portraying them as enemies of the people, is just one of the lines of attack used. Morano is the pit bull who carries those attacks out for them. He’s a hired hand and his main role is to intimidate and discredit climate scientists in the hope that they will withdraw from participating in the public discourse. And this is the guy who Nick Minchin thinks deserves to be part of the climate change debate. For me this goes to major flaw in the format of this show, in that it gives fringe-dwellers, ideologues and vested interests access to a prime time television audience to spread doubt about the science. No matter how well “balanced” the views of the sceptics might be, the outcome is the same – an audience increasingly confused and apathetic. What’s next? I can change your mind about… astrology… evolution… the earth being round… tobacco… gravity… fairies….. This entry was posted on April 24, 2012, 12:13 pm and is filed under Climate change, media, sceptics. You can follow any responses to this entry through RSS 2.0. You can leave a response, or trackback from your own site. It is interesting to compare the style of your response about Lindzen to that of Anna in the program. Neither of you say what is wrong with his science but both of you go for the man. F&A is deeply flawed and speculative. They count ENSO as an exogenous factor when it almost certainly isn’t. They think that TSI is the only influence from the sun, when it’s magnetic affect is also thought to be significant. And the real affect of volcanoes on temperature is not well understood either (with times in history when it is supposed to have caused cooling not lining up properly). The fact that climate science thinks that F&A chucking out real observed effects and then using models based on models to devine a “climate signal” is truly indicative of the science. Government interest in action on climate change is not hard to understand. Look at our government and the carbon tax. I think we can all agree it has almost no influence on climate change (even accepting the orthodoxy) except the ludicrous idea that it will encourage others to follow. However, it is a bloody good tool for social engineering and wealth redistribution. And this really is the crux of it, and why conservative parties are generally against action on climate change. The reason why they still nod and say it is important is because they are afraid of the shrill screams of denier that would surely come. When you break it down there is no need for a consipiricy. Climate scientists are victims of groupthink where anyone who goes against the current thinking is lableled a denier and shunned. So why would anyone want to go against the thinking? They also reinforce their own beliefs with confirmation bias (climate change in every weather event), and the idea that anyone who doesn’t agree is the evil enemy. Many people who get into climate science also already have an activist/alarmist postition and they are taught in universities by people of the same mindset (I’ve studied enviro science myself and seen this). All this adds up to what we have now where scientists have become advocates for a “cause” that they believe in so strongly that some believe that suspension of democracy is needed. Just one further point. I am staggered by how easily your arguments can be torn apart Graham. Your smug line that you finish with is evidence of the fact that this argument is about politics and ideology and not the science. Do you call people that link vaccines with autism deniers? No? Why not? they certainly lead to the spread of disease and death. Maybe it’s because there is no possible way that vaccines can cause autism. No smears in that argument, just science. The same can be said of any of the other pseudo-scientific examples you bring up. All have been disproven, and none have silly derogatory names. So why do you need to resort to name calling and claims of vested interest? Is it perhaps because your argument is weak? The key word there is the last one “only”. No. The tree rings were not used alone or only or exclusively. They had quite neatly and consistently lined up with several other temperature proxies, including non-tree ones, for centuries’ worth of data. They also lined up with a near century’s worth of accurate thermometer based data. The technical arcana of when you do and when you don’t rely on certain records is neither here nor there. Nobody in the scientific community “relies” on tree ring data “only”. Clearly you take an interest in the topic. You must have seen the ‘spaghetti graphs’ displaying all the various proxies. Corals, speleothems, sediments, boreholes, ice cores, and there are historical observations of Japanese cherry blossom festivals and other events. You don’t trust tree ring data? Ignore it. Ice cores or boreholes or cherry blossom dates are all data sources you can choose among to find ……. exactly the same thing. But climate scientists don’t come from “enviro” backgrounds. They come largely from physics, some from meteorology. Others stay more or less within their own specialties – agriculture, oceanography, glaciology and all the rest of them. You don’t really think that Gilbert Plass was an ‘alarmist’ in any sense other than anti-communist, surely. But his work on CO2 and heat-seeking missiles is central to the way climate science came together in the middle of last century – while plate tectonics was still getting its boots on. As for scientists wanting totalitarian governments – you must be joking. Physics and biology in particular still resound with the echoes of what happened to scientists in the USSR who tried to do real science rather than the ideologically “pure” science demanded by that particular totalitarian regime. And “…confirmation bias (climate change in every weather event)”? You can’t have been listening very carefully. Until a few months ago, you could predict the standard mantra from every climate scientist of any note “no single weather event can be attributed to climate change” or “weather is not climate”. Most of us who take an interest could recite it before the scientist in question started to speak. There’s been a bit of a shift lately, but not very much and not very far. All this quoting of yourself shows, is your own profound lack of understanding about how politically-funded science and especially the IPCC works – it is indeed corrupt and politicised to the core. The basic problem is your political naivete par excellence, unable and/or unwilling to see the implications of a science with a huge potential to help justify a more politicised society, being almost exclusively funded by politics. The CAGW idea is driven perhaps 95% by politics, 5% by science, which explains why those with a totalitarian ideological perspective are so fond of it – it means taxes etc can be raised without a murmur. George Bush and party politics don’t change the picture much, and certainly not quickly. The thousands/millions of people who actually run the in the various branches of the state – including the funding agencies – do make a difference. Being part of the state, they naturally allocate our tax money to people and projects that seem likely to advance their own interests – the interests of the state (‘state’ in the general sense, not the specific US one eg “Nevada”). There is no “mountain of evidence” to support CAGW, is is still highly speculative. The basic Tyndall effect is not in question, but this alone is no cause for alarm. The further positive feedback needed for alarm is still to be shown; and it may even turn out to be negative. But Yes, you’re right, I do fear a huge and unnecessary lurch into a more totalitarian world, being sold on the back of a science process that been corrupted so as to serve its political paymaster. Like many of your fellow alarmists, I’m guessing this is the very thing you welcome. In what world is meterology not an environmental science? Also, I question whether many have a purely physics background. Mann does, but many others are mainly statisticians. Furthermore many climate scientists point at physicists and meterologists (among other disciplines) and wheel out that “don’t ask a cardiologist about your lungs argument”. So what makes you a climate scientist then? You seem to have listed several environmental science fields and physics, then said they don’t come from enviro science fields. Gilbert Plass is not someone I confess to know much about. He was probably a good scientist. But I do feel that the sphere of knowledge has changed since the 1950s. Again I will point you to Trenberth remarking that we might need to suspend democracy to fix this problem. I point you to Gleick commiting fraud. The difference between now and what you are talking about is the power is reversed. These guys are trying to save the world dammit, and if they need to bend the rules or subvert our way of life to do it, they will (also see quotes by Al Gore and, Stephen Schneider regarding exaggerating facts to persuade people). This is in no way related to what you are talking about. And oh please, enough with the condescension, claiming I haven’t been listening. Theyv’e been banging on about wet weather and cold snaps being climate change for the last couple of years, since they realised that their previous claims weren’t coming true. And I’m pretty sure 350.org is not a sceptic website. There was an entire survey in America trying to connect weather events with climate to scare people. We are told that climate change will give us all kinds of crazy weather now. Where have you been that you have not seen this? I’m sorry but I think you really need to get out and read and see a bit more my friend. I make the effort to go to pro AGW sites (and hell, I even put my real name to my comments) and ask questions and read what people have to say. I am not a “denier”, I am a sceptic. And as such, if shown evidence that I find persuasive, I can be convinced. What I mostly find is people calling each other names (or threating to sue in the case of realclimate). I do question how much even professed CAGW believers actually think that the world will be beyond saving and we will all die in what is it, 10 years or so now? I mean they say this, but are still against hydro and nuclear power in Australia (despite the consensus amongst nuclear scientists, who must be the only ones that we should listen to, that it is safe and viable) for example. If you guys really do believe in this stuff (and not just green/renewable ideology) why is rubbish like solar and wind the only soloution touted? They count ENSO as an exogenous factor when it almost certainly isn’t. They think that TSI is the only influence from the sun, when it’s magnetic affect is also thought to be significant. However, it is a bloody good tool for social engineering and wealth redistribution. You see, saying that politicians are using global warming as a tool to “redistrbute wealth” is a conspiacy theory. A wacky one at that. There isn’t any doubt in my mind that you are a dishonest, ideologically-bound denier. You couldn’t discuss the science if your arse was on fire and your alarmist lurches into far-right propaganda are amusing, if not pathetic. However, thanks for admitting you aren’t motivated by logic or rational thought. Sorry, I wouldn’t know much about 350.org, I doubt I’ve ever linked to the site. Condescension? “… and hell, I even put my real name to my comments … ” Pots and kettles. As it happens I’m not hiding from an abusive ex which is one common reason for women not to use their own names, but my real name has the same problem as many real names. It’s exactly the same as someone else’s – who happens to be a journalist. To save us all a lot of unnecessary fuss and bother, I never mention my own name. I don’t have to explain that ‘I’ didn’t say whatever she might have written. She doesn’t have any cause to complain that things I say, or my clumsy writing style, have affected her reputation or her income. Who says it is? In this household, thorium reactors are the topic du jour – if ever I’m silly enough to raise the issue and thereby invite yet another sermon on said virtues. Rubbish rooftop solar is silently powering this computer and the rest of the household. Works a treat. In this state we already get over 25% of our power from wind. So that’s going along fairly well. Even my 85+ years old mum thinks it’s a disgrace that Germany gets more power from solar than we do here – and she’s from the “climate change, pah! this is the land of droughts and flooding rains” demographic. No. I don’t think we’ll all die in 10 years or so, though the sea ice in the Arctic will make some folks very fearful when it disappears some September soon. I do think a lot of people will suffer, and some significant % of them will die, when we have some simultaneous failures across the world in important crops in the next few decades. Whether those failures arise from droughts or floods or fires or pests doesn’t really matter – what matters is how short we will be of food or, more importantly, affordable food for the poor people of the world. safe and viable – for current nuclear technology? Safe, I wouldn’t know. Viable? I’ll believe it when I see an insurance company willing to take the whole risk and a bank willing to finance without government subsidies or guarantees – usually both. Thank you for reminding me that not all the Mann, Bradley, Hughes 1998 paleo reconstruction was based on tree rings. However, based on one analysis, only 13 of the proxies used out of the total of 112 showed a hockey stick effect. Twelve of these were, in fact, tree ring based. So they used 99 proxies that were basically noise, 12 tree ring proxies that were hockey stick shaped and 1 ice melt record that showed a hockey stick. So I maintain that my point still stands, if we cannot be certain that those 12 tree ring proxies were indicating temperature (possibly because of the divergence problem) then how can we put any faith in the final reconstruction? Yes I have seen the so-called “spaghetti graphs” but I regard these as a later attempt to bolster the earlier hockey stick chart. Some of these proxies seem to show a peak at about the year 1000 indicating a possible medieval warm period – as do the many peer reviewed papers itemised at the CO2Science.org. This evidence seems to refute the view that before the industrial revolution the temperature remained constant as suggested by the hockey stick chart. The “hockey stick chart” suggested nothing of the kind. It shows quite clearly that – in the Northern Hemisphere – there was an anomalously warm period. It also shows that this was followed by a NH cold period, the Little Ice Age. And you need to remember that their original interest in the work was in historical climate, not the modern. That was what the paper focused on as submitted. It was only when a reviewer suggested that they should display the modern record on the same graph for comparison that the hockey stick showed up. And it’s been showing up in all such work ever since. “Some of these proxies seem to show a peak at about the year 1000 indicating a possible medieval warm period … ” I know – to my cost. A year ago I even tried to do a “colour-chart” display with all the various results correlated to time periods and regions. I foolishly thought I could come up with a graph alternative, blocks of colours and shadings to show the intensity and extent of warm/ periods. Neither my computing skills nor my patience – nor the data – were equal to the task. They’re all over the shop. There are even a few with double peak warm anomalies a few centuries apart and a couple of double dips with cold periods. What I can tell you is that several regions had a century or so of warmer temperatures. The earliest started before the year 700, the latest ended 800+ years later. There are a few small clusters where more than one region was warm at the same time as others. Unfortunately for the *worldwide* warm anomaly notion, these clusters also show at least one other region that was either not warm or anomalously cold at that time. And the overlaps are not very wonderful, several only overlap by 50 years at the beginning or end of a period of 2 or 3 centuries. So, having dipped my toes in this unwelcoming water, I have a lot more respect for the people who’ve both the skill and the patience to produce those spaghetti graphs you so casually dismiss. And they are also very welcome to collect ice cores and speleothems all by themselves – not my cup of tea at all. There was a period of above average global temperature in medieval times (whether the warming was synchronous is not an issue) and hiding the decline was not the best scientific practice? No, you missed the point. It might have been above “average” but it was most likely cooler than now. The Northern Hemisphere was probably around 0.7 deg C cooler during the MWP than now: google PNAS-2008-Mann-0805721105.pdf . It is if you’re talking about GLOBAL warming and, like CO2science, trying to pretend that local warming events all happened at the same timeas each other. There was no decline hidden in any scientific journal paper. Sorry graphic. The issue is *global* warming. The stuff about the medieval period shows inconsistent, intermittently sustained Nothern Hemisphere warming. Southern Hemisphere – sometimes cooling, mostly neutral, a couple of warmish spots not coinciding neatly with the relevant NH warm periods. Not ‘global’ at all. Nothing at all like the sustained, worldwide, consistent warming shown in the oceans, the ice and the atmosphere of the last 5 decades. And you need to think about _why_ certain things are being done. Why have the North American continent nursery and seed companies helped to implement the new hardiness ratings for plants and crops from Florida to Quebec? It wouldn’t be because they can sell more avocadoes, grape vines, palms and ferns to more northerly customers along with more chemicals to control weeds and insect pests expanding their range, would it? Or do they just want a piece of paper to wave in front of customers complaining about peach and plum trees that won’t fruit because of reduced ‘chilling hours’. The issue seems to be global warming as measured by increased global average temperature. When people want to deny warming they point to parts of the world that were cooling at that time thereby “proving” that the affect was not global. When they want to demonstrate warming even when there was cooling they resort to global average temperatures to make the point. It is known as having it both ways. As to seed companies, I suspect they do not know any more about the climate than the scientists do. 5 decades: You must know what a ridiculously short time that is? It may seem large on the human scale but on a graph representing the life of the planet it cannot be seen. If you put two sheets of paper together in landscape, either A4 or letter size, the last million years can be covered by the thickness of the paper. A hundred years is one ten thousandth of the thickness of a piece of paper. I suspect that geologists know more about the climate and all its variations than the atmospheric scientists do because they have a much better sense of history. I watched the program that triggered this thread hoping to be given some serious pause for thought but, alas, it was not to happen. Thank you for your patience and perseverance. We may talk again sometime. As might the Roman warm period and the Minoan warm period and the previous three interglacials. All this is quite recent history. What happened before that when the CO2 levels were in thousands of parts per million? Did the world end then? It is to some people. I am not sure what semantic game you are playing here but Mann et al published graphs that, conveniently, had a decline in the tree ring proxy temperature data not shown. They terminated the plot early. The decline, if shown, would have highlighted the “divergence problem” which could have cast doubt on the earlier part of their reconstruction. When Phil Jones made his comment about using Mike’s Nature trick it was clear that he was going to repeat the same process – or dare I call it deception. YMMV as they say on the internet but I am not convinced by your reasoning. No. But handily we weren’t around then. They don’t need to know much. All they need to know is which plants will and won’t grow, flower, set seed, crop in which soil and climatic regions. If you seriously believe that every single one of the horticultural and agricultural specialists they employ are entirely ignorant of which areas, soils, times are best or least suited to particular crops and other plants, then I don’t really know what more can be said. There is no global climatic cooling occurring now, of course, and the Northern Hemisphere average is most likely warmer than at any other time in the last 1000 years. they resort to global average temperatures to make the point. This is known as a strawman argument. As might the Roman warm period and the Minoan warm period and the previous three interglacials. All this is quite recent history. I wonder where this non-sequitur is leading us. What happened before that when the CO2 levels were in thousands of parts per million? Did the world end then? The world didn’t end when the oceans were a metre higher or even tens tens of metres higher than they are now. However, the last time the oceans were a metre higher, there weren’t 10 million people in what is now Bangla Desh living in areas that were submerged at that time. What are those 10 million people going to do when the world “doesn’t end” and their land is submerged by salt water? Are we going to say to them “don’t worry about it, it’s not the end of the world”? I don’t think so. You seem to have some difficulty making up your mind whether it is or isn’t an issue. I am not sure what semantic game you are playing here but Mann et al published graphs that, conveniently, had a decline in the tree ring proxy temperature data not shown. Absolute garbage. You have been sucked in hook, line and sinker. Mann did not publish graphs that left out tree ring proxy data beyond a certain date. Look at MBH98 and MBH99 for example. The proxy reconstruction goes right up to 1980 which is when the proxy data ran out. If you really want to find out what was hidden and where (in a report for non-specialist readers for the WMO) then listen to Peter Sinclair. There is no semantic game. There was no decline hidden in any peer-reviewed paper published in any scientific journal. The divergence issue for a minority of tree-ring proxies is, however, published in peer-reviewed scientific journals and is well known. When Phil Jones made his comment about using Mike’s Nature trick it was clear that he was going to repeat the same process – or dare I call it deception. Mike’s Nature “trick” was to add in actual temperature data. Perhaps you think that giving people extra information is deceiving them.